Eric Pemberton has lived on the Isle of Dogs for 30 years and is a well known figure working for the local community. 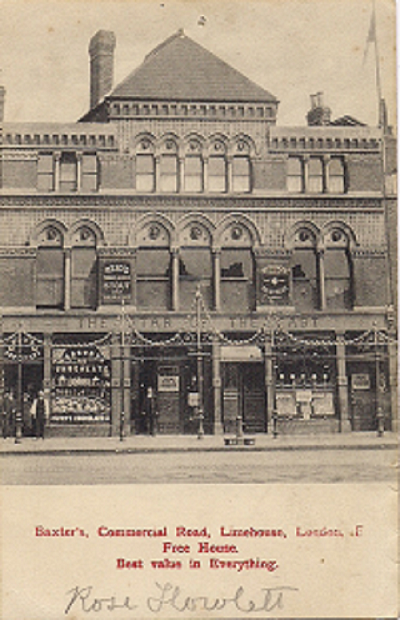 Eric has a great interest in local history and very kindly has given me access to some of his collection of postcards and ephemera about the Isle of Dogs and surrounding areas. Over the next few months I will share these with you. 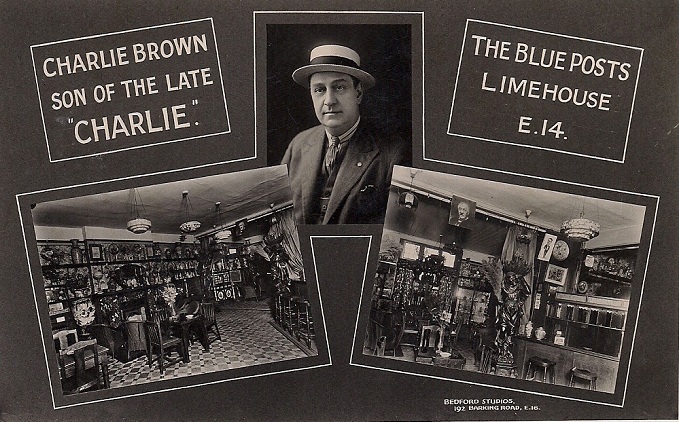 A postcard from early 20th century showing all the sights of Limehouse. 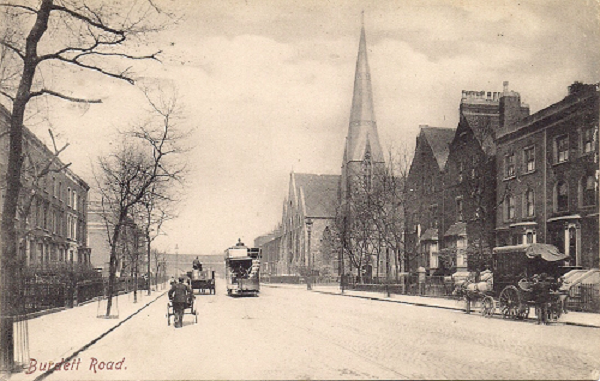 St Annes Church, Burdett Rd, Salmon Lane. 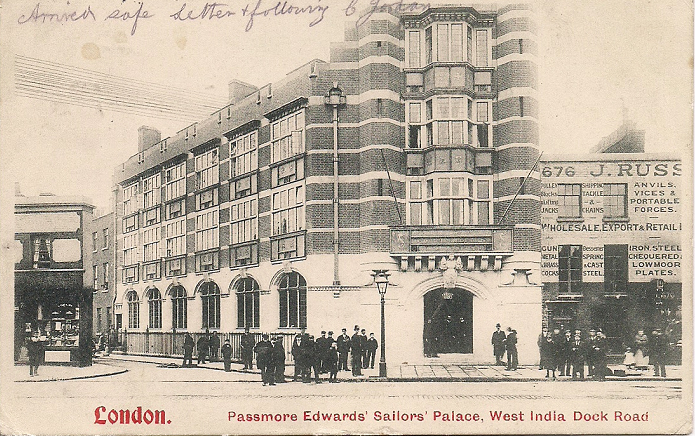 The Passmore Edwards Sailors Palace or Jack’s Palace as it was known was a hostel for Seamen. 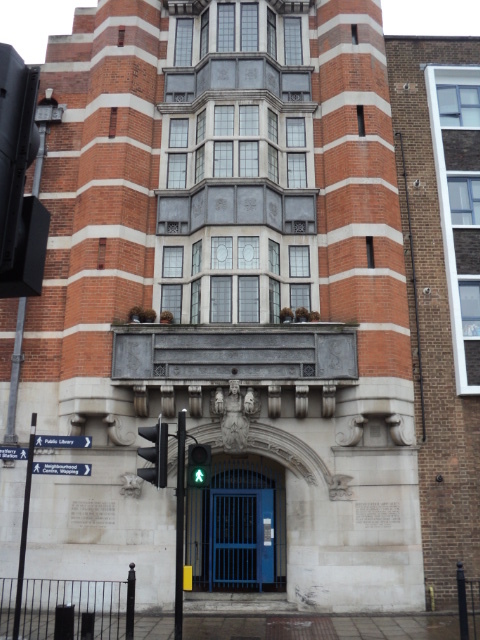 In 2013, the building still exists but has been turned into a block of flats. 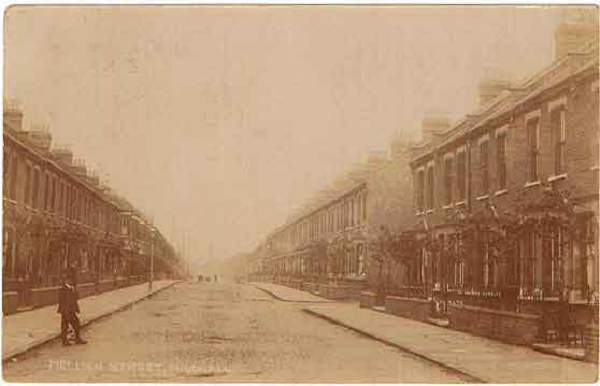 Burdett Road going to Mile End by Horse Drawn Tram 1906. 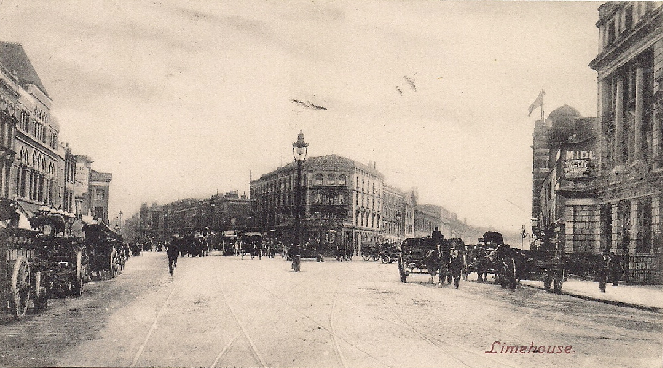 A view of Limehouse from Commercial Road looking towards West India Dock Rd. The original Charlie Brown was a legendary East End character, this was his son who ran a pub in Limehouse. 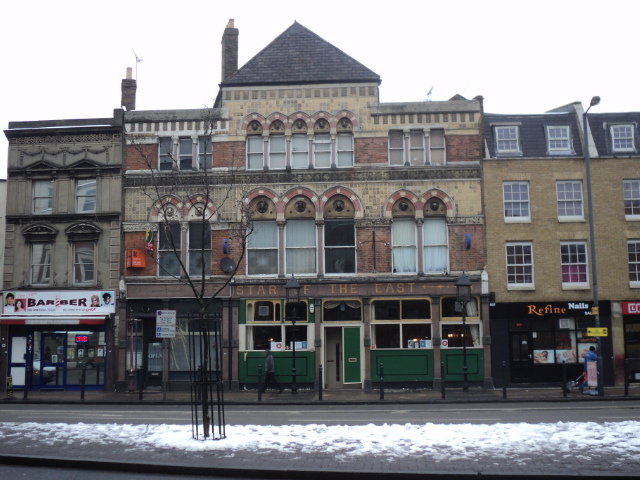 The Star of the East pub was run by the Baxter Family for many generations. In 2013 It is still there with two original gas lamps outside. 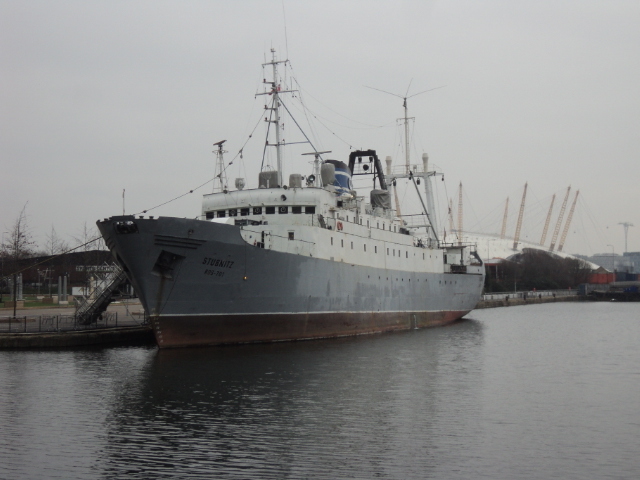 A new visitor to West India Dock is the MS Stubnitz, a East German made ex fishing vessel which has been transformed into a floating cultural venue. 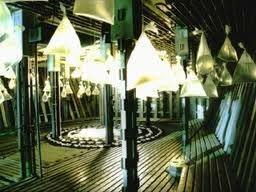 The MS Stubnitz was rescued from the scrapheap at the end of the cold war by Urs “Blo” Blaser a Swiss sound artist. 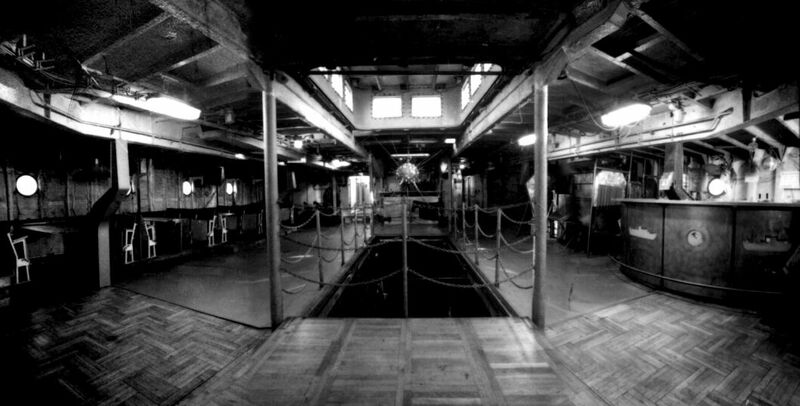 He then set about transforming the ship into ” a moving platform of cultural research and exchange “. Since 1998 the ship has travelled around the Baltic and the North Sea docking in cities such as Amsterdam,Copenhagen,Hamburg and St Petersburg. 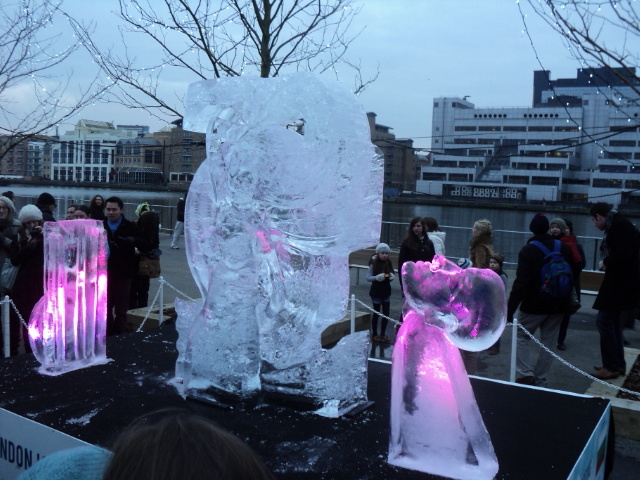 It arrived last summer to be part of the Bloc Party/London Pleasure Gardens event which had to cancelled due to safety concerns. 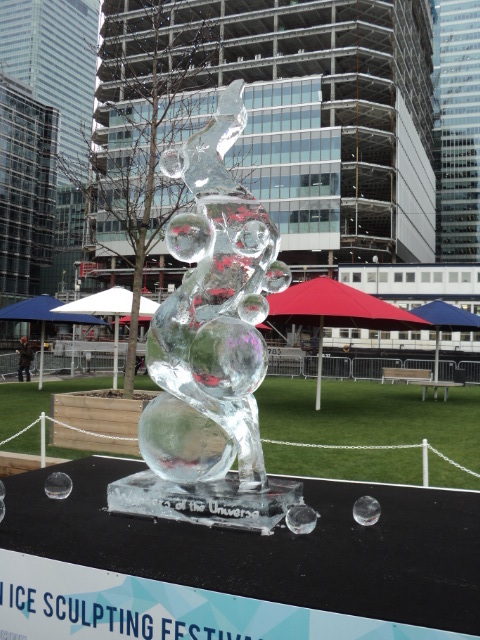 But has held a number of events in the Royal Docks where it was previously moored. The 1850s was a boom time for the Isle of Dogs, the building of Brunel’s Great Eastern and other shipbuilding on the Island had attracted workers from all over the United Kingdom. However by 1866 there was a financial crash that devastated the shipyards which caused great distress among thousands of workers. This distress continued unabated for the next three years putting considerable strain on local authorities and charities to provide relief. 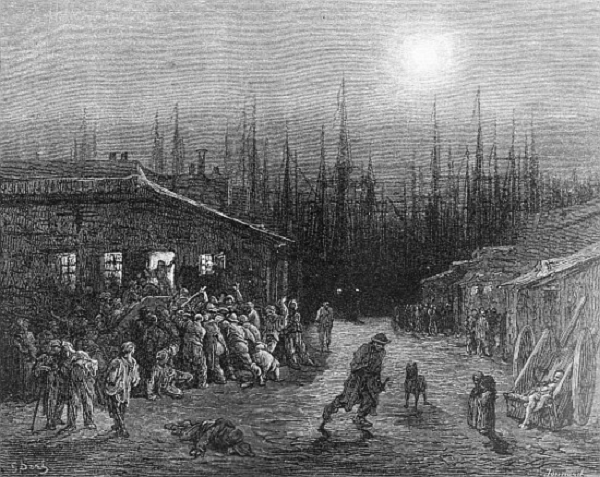 It was against this background that the story of the death of a young woman and child on the Isle of Dogs in 1869 gained national and international notoriety. The exact details were recounted in Ruskin’s book Eagles Nest. and some time since part of the furniture had been seized by the brokers for rent. his wife’s death the poor man went mad, and he was taken to the workhouse. The story appeared in many British Newspapers and was published widely aboard most notably in The New York Times. Although this was a tragic story, many people at this time were destitute and many died from starvation. What set this story apart was a number of factors, it illustrated that even the respectable poor who had worked but were now unemployed were faced with the choice of taking local charity which barely covered the rent or face the horrors of the workhouse. The religious tract on the table for some indicated that even the church had let Catherine down. The callousness of the juror who was more concerned about the good name of the Island was widely criticised and for many illustrated some of the hypocrisy of Victorian society. Many writers and social reformers used the case to fight the social ills of the time and promote reforms. The shame of this case and others to Victorian society did lead to greater Church and philanthropic works in the East End but the scale of the problem led some Victorians began to consider that part of the answer was to help people to emigrate. By the late 1860s and early 1870s there was a number of Isle of Dogs people who took advantage of this help and went to Canada and Australia. The story was remembered by the Reverend Joseph B McCaul who was Canon Of Rochester Cathedral and Rector Of St. Michael Bassishaw,City of London in 1880 when he wrote this poem. Of Cubitt Town, Isle of Dogs ? Amidst typhus, famine, and fogs ! That sensational novel down ! Saxon’s Alley in Cubitt Town. It is terribly true — Alack ! It is Catharine Spence, aged thirty-four. With a new-born babe at her side ! Had she no husband to work, or beg. Stone-breaking at eightpence a day ! After death gave his wife release ! In that home of typhus and fogs ? 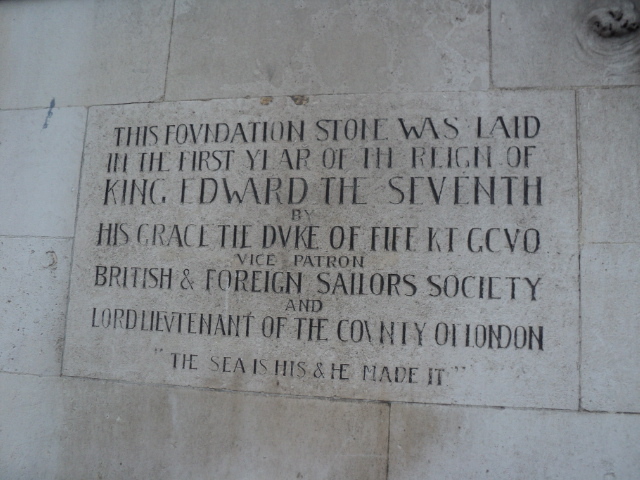 It is one of the curiosities of the Isle of Dogs and the East End in general, that in the Ninetieth Century and at the turn of the Twentieth Century writers and journalists visited these areas and wrote articles as if they had travelled to a distant country rather than area close to the centre of London. George R Sims was a journalist, author,poet and social reformer who sought to raise awareness of the social conditions of the poor. He was also known for his sense of humour and the following account illustrates his particular style of writing. JUST outside the West India Dock Station there is a little one-horse ‘bus which takes you by a winding way of high, black walls, broken here and there by bridges and wharves and the towering masts of ships, to Millwall. As you near the journey’s end the driver – there is no conductor – opens a little trap in the roof of the ‘bus and puts his hand through. In his open palm you deposit the penny for your fare, and a few moments later the ‘bus stops, and you alight and find yourself at the commencement of the West Ferry Road and in the famous Isle of Dogs. It is the island note that greets you at first. If the bridge is up you have to enter by the lock gates, and you may, by a stretch of the imagination, fancy yourself performing a Blondin feat, with the welcome addition of a row of protecting chains on each side of you. Across the water you are in a land of one familiar sound and a score of unfamiliar scents. The sound is one ever dear to the Briton – the clang of the hammer as it descends on ringing iron. You listen to the sound that speaks of England’s might, and you remember the song that Charles Mackay sang of Tubal Cain. The memory that the scents bear in upon you is of another poet – Coleridge, who sang of Cologne. The odours are overpowering. They do not mix, but with every breeze each salutes you with its separate entity. One odour is that of heated oil, another that of burning fat, others are of a character which only visitors with a certain amount of chemical experience could define. The odours saturate you, and cling to you, and follow you. They are with you in the highway and the by-way. You pass into the house of a friend who has offered you his hospitality at the luncheon hour, and the door that closes behind you does not shut them out. Nothing is sacred to them, not even the church. Even the flowers in the little gardens that the West Ferry Road can show here and there have lost their own perfume and taken that of the surrounding industries. The island is no dreaming place. It is a land of labour. From morn till eve the streets are deserted; the inhabitants are behind the great walls and wooden gates – husbands, wives, sons and daughters, all are toiling. The only life in the long, dreary roads and desolate patches of black earth that are the distinguishing notes of the side streets is when the children come from school. Then the red and blue tam-o’-shanters of the little girls make splashes of colour here and there, and the laughter of romping children mingles with the clang of the hammer and the throb of the engine. So over the Thames – or rather under it by County Council subway – that portion of young Millwall which has not passed on to Poplar hastens, and finds in Greenwich a welcome surcease from the miserable monotony of dead wall and black chimney-pot. 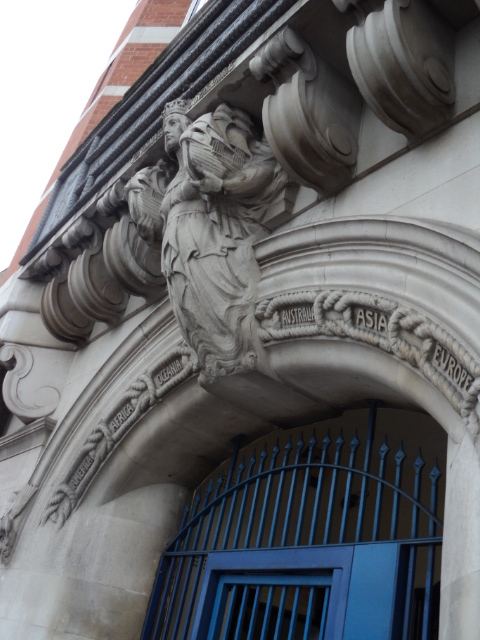 There is a Ladies’ Settlement, St. Mildred’s House, in Millwall, which suggests the refining influence of gentle womanhood. The conditions of life among the women workers of the place are affected by the nature of their employment. The dirt of their drudgery, the odour of their occupation, are brought into the home by the men and women alike. There is no escape from either. But the humanising influences brought to bear upon the situation have not been altogether in vain, and in the little back-yards and scanty patches of green still left here and there before some of the houses there are flowers struggling to be pretty under difficulties, and fowls and rabbits that look considerably plumper and healthier and happier than their owners. Island Gardens lies at the southern tip of the Isle of Dogs overlooking the river Thames, visible from the river and from Greenwich. 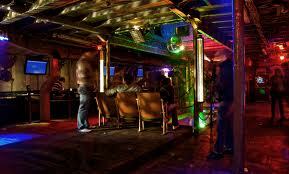 It is famous for its classic views over the river to the buildings and sights of Greenwich. The view was judged to be the greatest view in Europe by Sir Christopher Wren in the 17th Century. 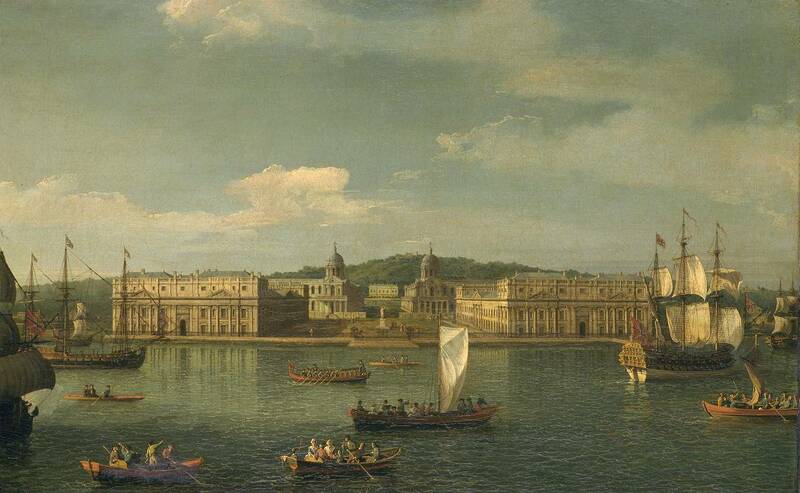 It is especially associated with the painting of Greenwich from this spot by Giovanni Antonio Caneletto in the 18th Century. Up to the 19th Century most of the Isle of Dogs was farmland, however when shipbuilding and other industries began to spring up along the riverfront, the land that became Island Gardens was leased to the Admiralty who wished to preserve the site to maintain the views to Greenwich. However it was not until 1893 when there was a movement to turn this space into a public open space. 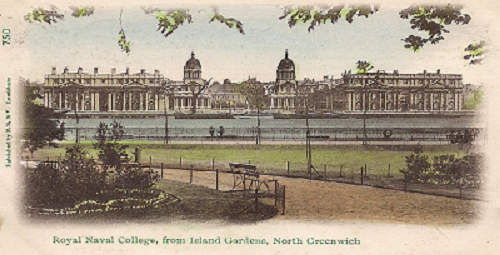 This was achieved in 1895 when Island Gardens was considered “a little piece of paradise” amongst a rapidly industrialised and residential environment. Most people are agreed that this is one of the great views of London, a view that almost unique in London due to the fact that it has remained virtually unchanged over the last 300 years. 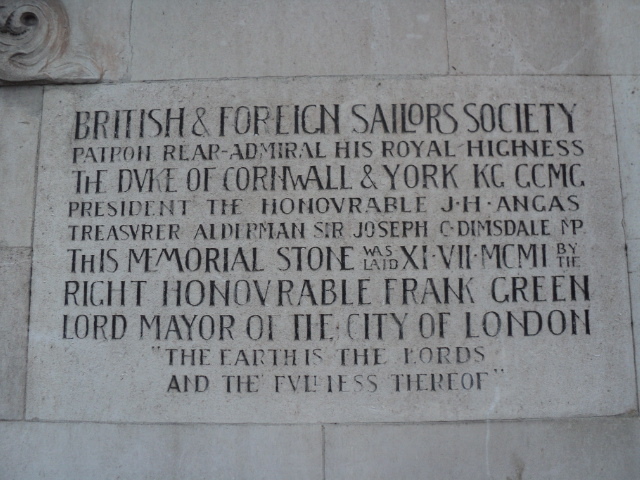 It is also a tourist attraction that is visited by thousands of visitors every year, many who come from Greenwich through the foot tunnel. 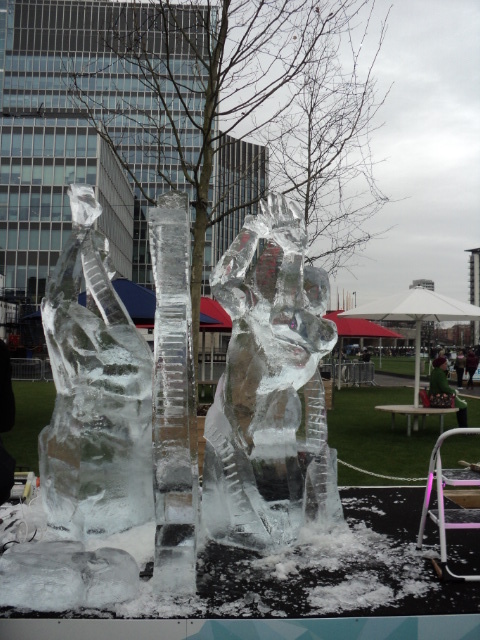 It is used extensively by local residents who value it as one of the few green spaces left on the Isle of Dogs. 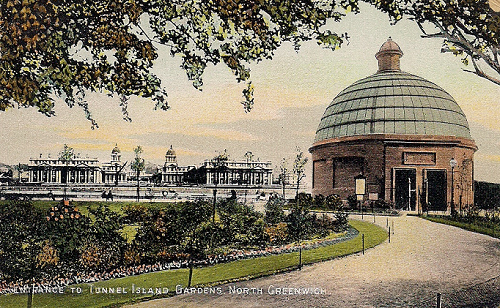 The Gardens lie within sight of Greenwich World Heritage Site . Island Gardens is on the English Heritage Register of Parks and Gardens of Special Historic Interest; Island Gardens and the lift tunnel rotunda are listed Grade II. The Gardens sit at the centre of the Island Gardens Conservation Area. However in the 21st Century these classic views are considered under threat from encroaching developments of riverside property developers. 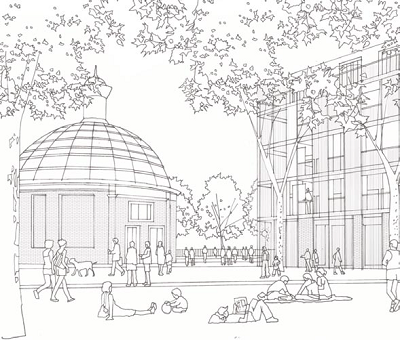 In 2011/2012 planning permission was sought to build a five-story block of Flats almost adjacent to Grade II Lift tunnel rotunda. Local residents objections are not based on that there should be no development, but rather that any development should be sympathetic and in keeping with its surroundings. They also point out that it is in the centre of a conservation area which was created to protect the gardens. “No one has any objection to the site being developed as long as it is in keeping with the present layout, five storeys is too much, the block would go immediately on the left of the entrance dome thus destroying that aspect and the axis to and from Island Gardens. If allowed it means the whole area could be redeveloped and more tower blocks thrown up. Parm Mahil another local resident has set up a petition that already attracted 500 signatures. If you wish to show some support for the campaign please sign the petition by pressing here. 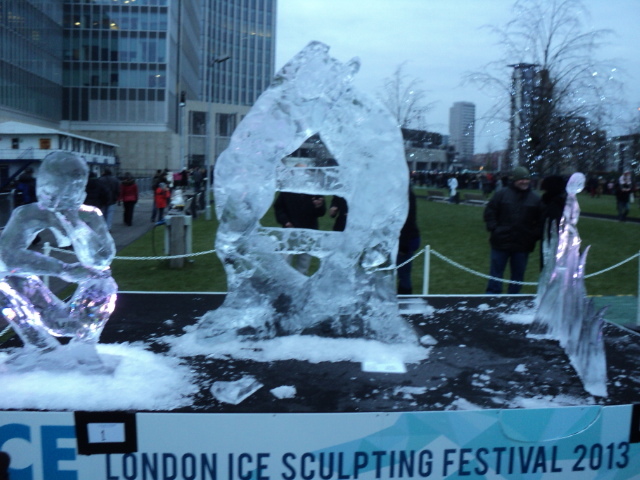 On Sunday it was the last day of the London Ice sculpting Festival and despite the near freezing temperatures there were large crowds to see the Freestyle Competition. 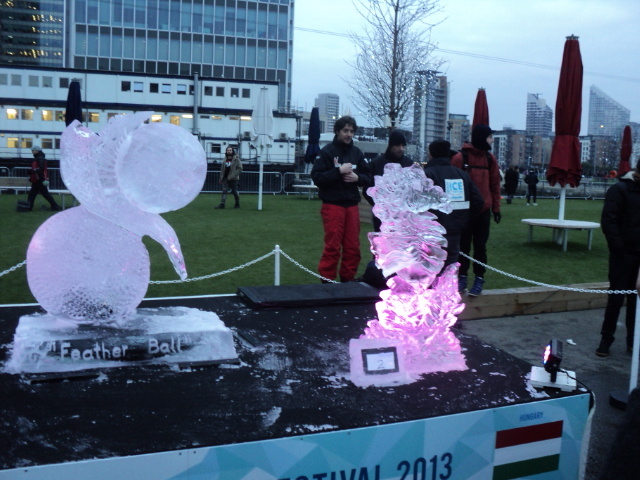 The ice sculptors were allowed to create their own designs, here are a few of their amazing efforts. 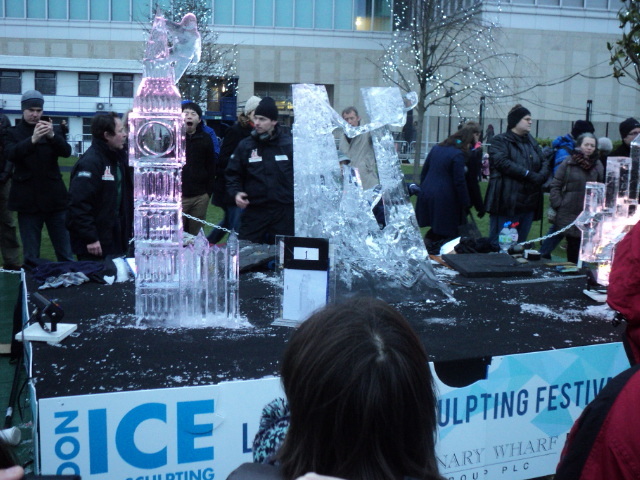 Day two of the London Ice Sculpting festival at Canary Wharf brought out the crowds in near freezing conditions. Today it is the doubles competition with the theme Wonders of the Universe. 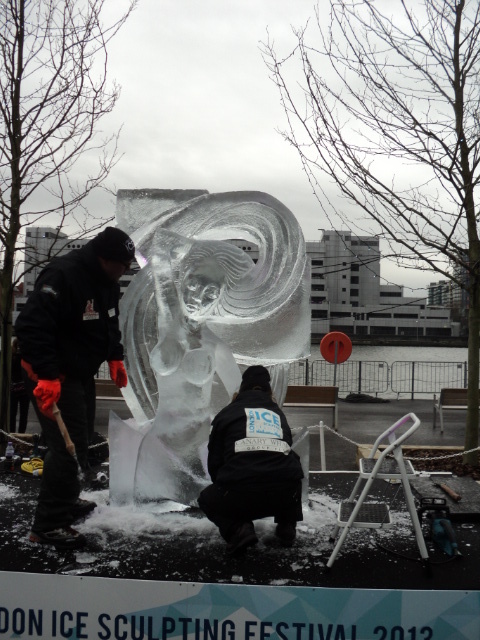 The teams from Europe and the USA were showing their considerable skills. 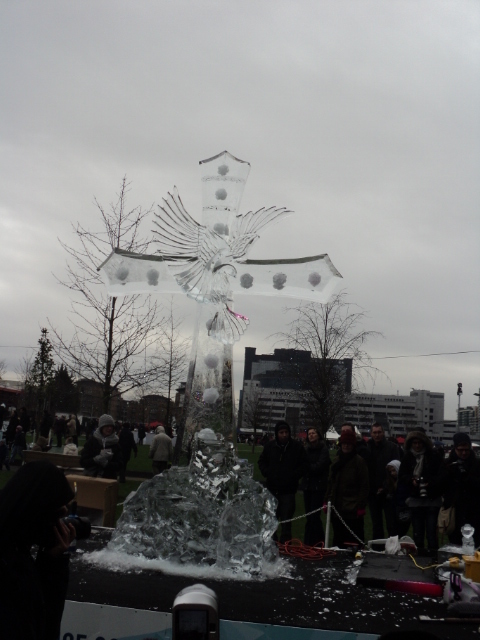 The Cross from the USA team.